Make salad for four with veggies galore with our new Garden Fresh Salad Set! Even the pickiest eater will happily pretend to create and eat this salad! Using the large serving bowl, toddlers can toss up mixed lettuce greens with tomato and cucumber slices, carrot crinkles and pepper rings, and serve into four small individual bowls with perfectly sized salad tongs. All of the play food items are made of soft, durable, rubberized plastic with a real-life look and feel. 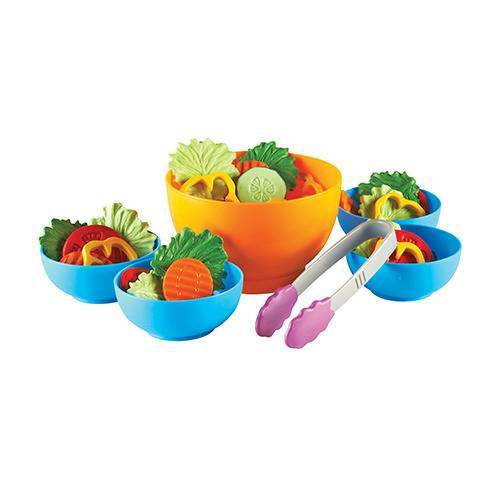 Encourage healthy eating habits from the start and teach the concepts of serving and sharing with this appetizing set! Using the perfectly sized tongs, little ones will practice their gripping (fine-motor) skills, while placing the food items in the bowls strengthens hand-eye coordination.